Boost your child's understanding of the different types of pronouns and their function in sentences with this set of resources. Make sure to go over the meanings of the words "indefinite," "possessive," and "relative" when teaching pronouns so that each type of pronoun makes more sense. When you notice that a particular pronoun, such as "whomever," is tricky for your child, spend some time comparing sentences where this pronoun is used correctly and incorrectly. This set of resources gives your students practice boosting their understanding of the different types of pronouns and their function in sentences. Pronoun agreement can be challenging for even native English speakers, but this is especially difficult for English learners. Make sure to go over the meanings of the words "indefinite," "possessive," and "relative" when teaching pronouns so that each type of pronoun makes more sense. When you notice that a particular pronoun, such as "whomever," is tricky for a student, spend some time comparing sentences where this pronoun is used correctly and incorrectly. This activity will help your students learn and practice matching possessive pronouns correctly. 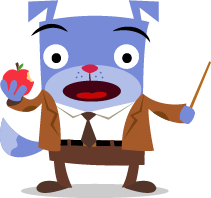 This activity will give your students more practice matching possessive pronouns correctly. It is time to take the geometry concept of area to the next level! 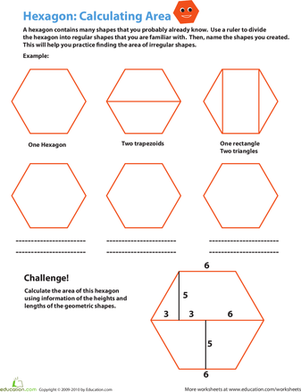 These worksheets teach your child to find the area of more complex 2-D shapes, such as octagons and compound shapes. Bring this concept to life by asking your child to find the area of your house or a section of your house. It is the perfect real-life application of finding the area of a compound shape! It is time to take the geometry concept of area to the next level! 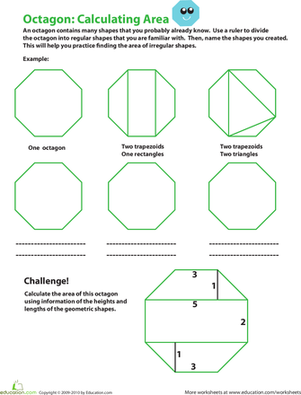 These worksheets teach students to find the area of more complex 2-D shapes, such as octagons and compound shapes. Bring this concept to life by asking your students to find the area of their house or a section of their house. It is the perfect real-life application of finding the area of a compound shape! In this fourth grade geometry worksheet, your child will learn how to calculate the area of a hexagon by breaking it down into rectangles and triangles first. 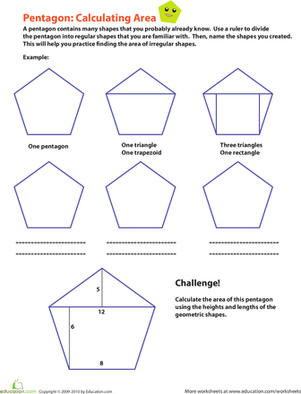 In this fourth grade geometry worksheet, your child will learn how to calculate the area of a pentagon by breaking it down into rectangles and triangles first. In this fourth grade geometry worksheet, your child will learn how to calculate the area of an octagon by breaking it down into simpler shapes first. 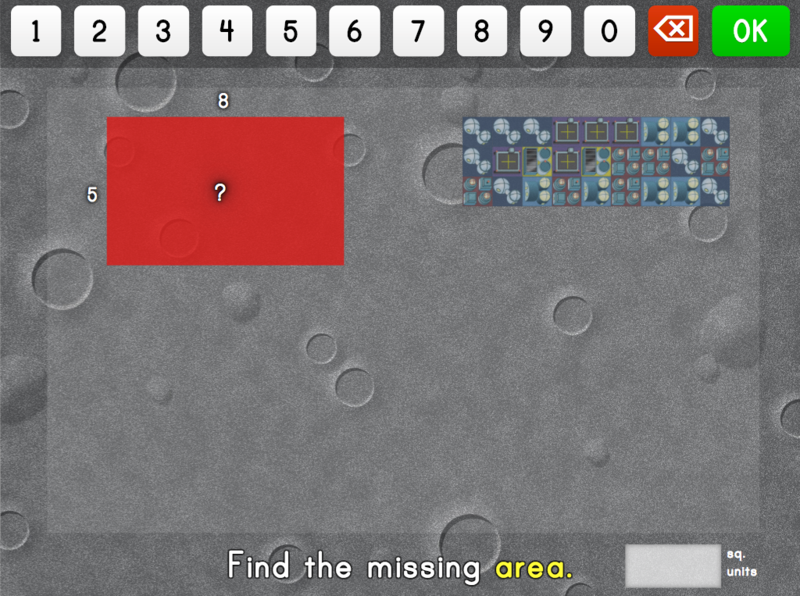 What Do You Know About Area & Perimeter? 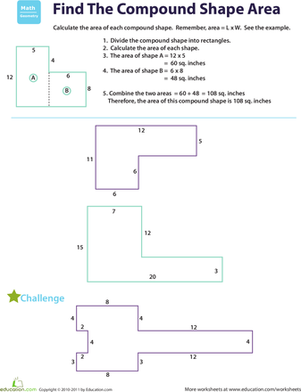 Kids practice finding area and perimeter with this worksheet. It's not everyday that you see shapes like these! This worksheet helps your fourth grader practice finding the area of compound shapes. Kids practice determining area and missing lengths and widths with these space-themed visual models. 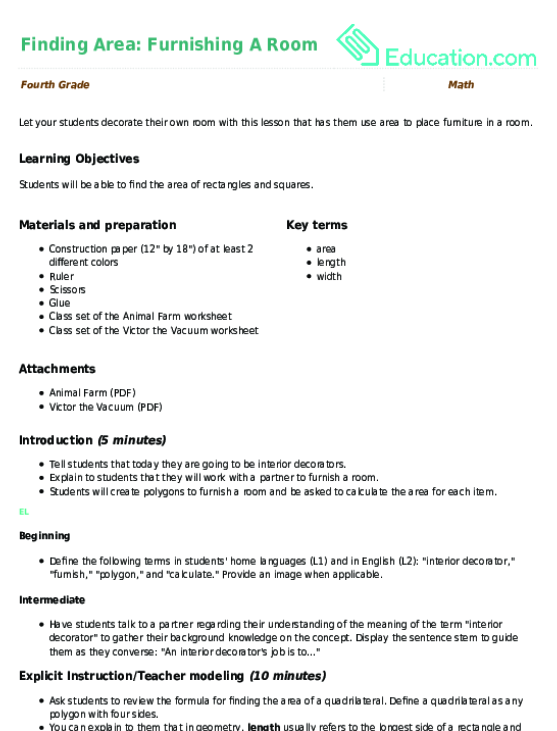 Let your students decorate their own room with this lesson that has them use area to place furniture in a room. Drama and poetry can open up a literary world of excitement for your child. This collection of activities ranges from the classic Reader's Theater to discovering rhythm in poetry to understanding a screenplay. Integrate visual arts by having your child interpret the text and create an illustration to go with it. Exposing your child to a variety of poetry and drama can enrich their vocabulary tremendously. Drama and poetry can open up a literary world of excitement for many students. This collection of activities ranges from classic Reader's Theater to discovering rhythm in poetry to understanding a screenplay. At this point in the year, many schools are in the throes of state testing. Reading fun literary genres like drama, scripts, and poetry can help ease students' stress. Exposing students to a variety of poetry and drama can enrich students' vocabulary tremendously. To help struggling students, be sure to pre-teach any challenging words before you read the text. Integrate visual arts by having students interpret the text and create an illustration to go with it. You won't strike out with this lesson on finding the theme of a script. 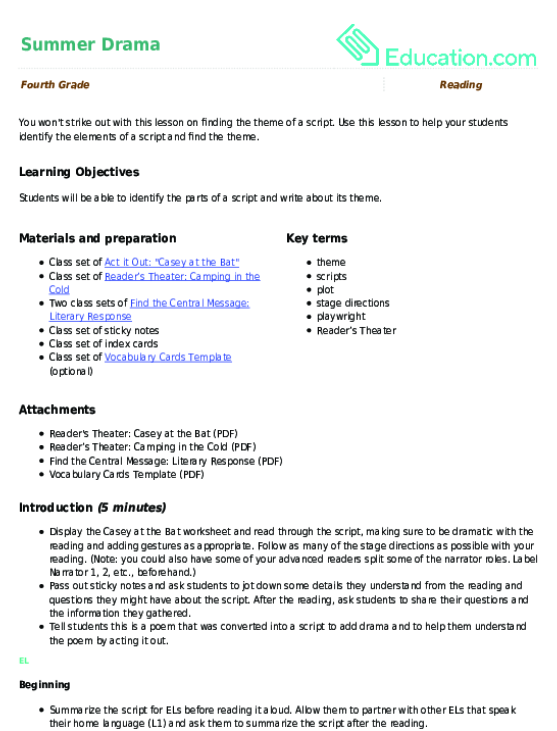 Use this lesson to help your students identify the elements of a script and find the theme. This week is all about haikus! Haikus are a great introduction to the art of writing poems because they are short, simple, and do not have to rhyme. 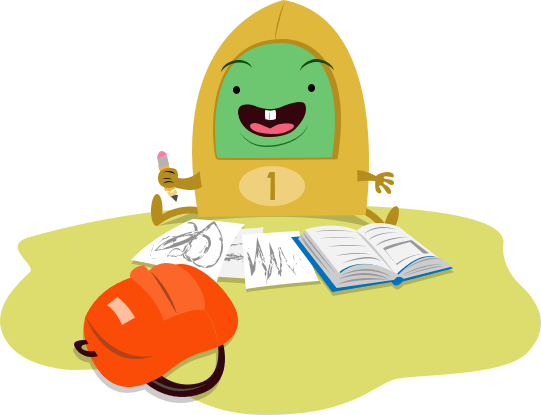 Challenge your child to write haikus about the successes and struggles of fourth grade. This week is all about haikus! Haikus are a terrific way to get students into the art of writing poems because they are short, simple, and do not have to rhyme. Students are often self conscious about writing and sharing poetry, so initially keep the topics neutral, such as weather or nature. Once they are more comfortable, challenge them to write haikus about the successes and struggles of fourth grade. Host a haiku poetry slam in your classroom, in which students perform their favorite haikus, and invite other classrooms to be the audience. Budding writers can find their inner zen and build creative writing skills by practicing some haiku poetry.